2. Before 2001, the Greek drachma. 3. The .eu domain is also used, as in other European Union member states. Greece (Greek: Ελλάδα [eˈlaða] or Ελλάς [eˈlas]), officially the Hellenic Republic (Greek: Ελληνική Δημοκρατία [eliniˈkʲi ðimokraˈtia]), is a country in Southeastern Europe. Its capital city is Athens. It borders Albania, the Republic of Macedonia and Bulgaria to the north, and Turkey to the east. The Aegean Sea is to the east and south of mainland Greece, the Ionian Sea is to the west. Both are part of the Eastern Mediterranean Sea and have many islands. The official language spoken in Greece is Greek, spoken by 99% of the population. Many Greeks also understand English, French and German, which are taught in schools. 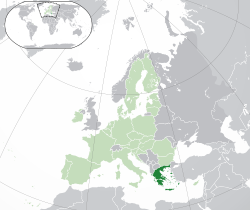 Greece became a member of the European Union in 1981. Greece's history is one of the richest in the world. The Greeks were one of the most advanced civilizations. Greece is famous for its many philosophers, like Plato and Aristotle, and kings like Alexander the Great and Leonidas. Greece is said to be the birthplace of Democracy, because city-states like Athens, now the capital of Greece, were the first to elect their leaders and not have kings. During the years of Alexander the Great, a huge Greek empire was created that stretched from modern-day Greece to Egypt and Iran, until the borders of India. Because of the significant role that Greek culture played during that time, it is called the Hellenistic period (or Greek-dominated period). During that time, the Greek language became the 'lingua franca' of the middle east, which means the language that people who do not speak the same language use to communicate, like English is used today as an international language. Greece was then ruled by the Roman Empire, and many argue that Rome conquered Greece with its army, but Greece conquered Rome with its culture. The Roman Empire after the conquest of Greece became a civilization known as the Greco-Roman (or Greek-Roman) civilization. When the Roman Empire collapsed, the Greeks emerged as the ruling class of the East Roman Empire, and the Greek language became the official language of the country, which included all the eastern Mediterranean Sea, Turkey, Egypt and other countries in the area. It was then occupied by the Ottoman Empire for a period of 400 years. Some areas of Greece, like the second-largest city in the country, Thessaloniki, were occupied for 500 years and became part of Greece less than 100 years ago. Greece was bigger in 1920 that it is today. The Greek War of Independence began on the 25th of March 1821, according to tradition, and Greece was an independent country (a republic) in 1828. In reality, the Greek War of Independence began on 23 February 1821, when Alexander Ypsilantis(Greek Αλέξανδρος Υψηλάντης) declared the start of the revolution in modern-day Romania. In 1832 Greece was made a kingdom by the United Kingdom and Russia, under the German Wittelsbach dynasty. Greece fought in both World War I and World War II in the side of allies. In 1912, Greece took part in the Balkan Wars, where it gained many of the territories that make up the country now, such as Greek Macedonia and the islands of the Aegean Sea. In 1920 Greece expanded again, and reached its maximum size, but the territories that the country had gained in Turkey were given back to Turkey in 1923, but Greece kept Western Thrace. In 1940, Greece was invaded by Italy, but managed to defeat the Italian invasion and marked the first victory of an Allied country against an Axis power (the side of Hitler). After the defeat of Italy, Hitler decided to attack Greece sooner than he had planned. Germany invaded on 6 April 1940 and captured Greece's second-largest city of Thessaloniki on 9 April, while Athens was captured on 27 April. Greece suffered major damages in the Second World War and was involved in a civil war between 1946 and 1949, which left the country devastated and the people very poor. The Greek civil war was fought between the communists and the people who supported the king, who also had support from the United Kingdom and the United States. In 1967 the military took control of the country and restricted democracy. Free elections were then held again 7 years later, and the Greeks voted to send the king away and declared a republic in 1974. Greece became a member of the European Union in 1981. Greece had seen rapid growth in the 1990s, but some of the country's economic statistics were modified to appear more correct than they were, as the government had lied with the help of banks from the United States. In 2004, Greece hosted the Olympic Games for a second time. Since 2009, Greece has been in an economic crisis, which is also becoming a political crisis. The Greek parliament is in Athens. Greece is not a federal state like the United States, but a unitary state like the United Kingdom. It is one of the most democratic countries in the world and is ruled by a parliament, called the Hellenic Parliament (or Greek Parliament in Simple English), which has 300 members. It is a parliamentary republic, which means that, unlike in the United States, the President has very few powers. The person in charge of the government of Greece is the Prime Minister, who is elected by the people in elections every four years. Greece was a kingdom for most of its history as an independent nation. It officially became the Third Hellenic Republic (or Third Republic of Greece in Simple English) in 1975, when the monarchy was abolished by a popular vote. Greece was under a military dictatorship between 1967 and 1975, which collapsed after the invasion of Cyprus, and handed over power to Constantine Karamanlis. Demonstrations by the students of the universities across Greece took place in 1973, but were suppressed by the regime, which sent a tank to crash the gates of the Athens Polytechnic and forcefully stop the protests. Greece was also under a fascist dictatorship from 1936 until 1941, when it was invaded by Nazi Germany. During World War I, Greece was divided into two countries, the State of Thessaloniki in the north and the State of Athens in the south. Both countries claimed to be the legitimate government of Greece, but the State of Thessaloniki received support from the Allies. The country was reunited in 1917, when the King abdicated. There are many political parties in Greece, but only seven are in the Greek parliament. Only two political parties form governments, the PASOK party (which is social democratic) and New Democracy (which is conservative). The current government is led by PASOK, DIMAR AND ND. Other parties include the Communist party, the nationalist party and others. Greece is a small country compared to other countries such as the United States, Spain , Italy, and the United Kingdom. The population of Greece is estimated to be over 10 million. Most of the people in Greece are Greeks, and they form 94% of the population of the country. There are also many Albanians in Greece, and they make up 4% of the population. Other nationalities make up for another 2% of the country. The Greek government recognizes only one minority in the country, the Turkish one in the region of Thrace. The dispute between Greece and the Republic of Macedonia has caused result the refusal of Greece to acknowledge the existence of a Macedonian minority, but the 2001 population census (the number of people in the country) showed only 747 citizens of the Republic of Macedonia in Greece. The Republic of Macedonia says that there are a maximum of 300,000 ethnic Macedonians in Greece, but Greece says that if there is a minority in the country, it would not be more than 30,000 people, in the northern part of the country, near the border with the Republic of Macedonia. This is also supported by international organizations. The Greek flag is blue and white. The Greek flag was officially adopted in 1828 as a civil and state ensign (a flag for use only on boats and ships) and as a national flag when flown outside of Greece, for example on embassies. A different flag (white cross on a blue field) was used as a land flag within Greece from 1828 until 1969 and from 1975 to 1978. In 1978 the current flag became national flag and the older land flag was abolished. There are many theories about the origin of the color of the flag. One says that the blue represents the color of the sea and the white represents the waves, and others include white for the waves and blue for the sky and white for purity and breakaway from tyranny and blue for Greece. There are nine stripes on the flag, which according to the legend represent the nine syllables in the phrase “Ελευθερία ή Θάνατος’’ which means “freedom or death.’’ The cross stands for Christianity. The money used in Greece is called the euro. Greece is a capitalist country, like the United States and France. Greece has the largest number of trading ships (a 'merchant navy') in the world. Tourism is also a major source of income for Greece. In the 20th century Greece had its own currency but now uses the Euro as most other European Community countries do. Greece has adopted some welfare state policies, such as public healthcare and free education, like many other European countries. The pension system of Greece has created serious problems for the whole country. The fact is that thousands of Greeks are retired before the age of 55. The government has been very popular by adjusting the retirement age several times. Currently the average age of retirement is 50 for women and 55 for men. This is putting Greece in a very difficult situation when the country has accumulated a debt of about €350 billion, or debt by 170 per-cent of the country's total GDP. Greece also has a deficit, meaning that it buys more things than it sells. The country is cutting costs and asking for loans in order to avoid bankruptcy. About 16.5 million tourists visit Greece each year. That is more than the country’s entire population. Since there are so many tourist in Greece, it has many international airports. ↑ "Demographics of Greece". European Union National Languages. http://www.eurfedling.org/Greece.htm. Retrieved 19 December 2010. ↑ 2.0 2.1 2.2 2.3 "Distribution of Family Income – Gini Index". The World Factbook. Central Intelligence Agency. https://www.cia.gov/library/publications/the-world-factbook/fields/2172.html. Retrieved 9 July 2010. ↑ "Πίνακας 7: Αλλοδαποί κατά υπηκοότητα, φύλο και επίπεδο εκπαίδευσης – Σύνολο Ελλάδας και Νομοί [Table 7: Foreigners by citizenship, gender and educational level -Whole of Greece and Prefectures]" (in Greek). Greek National Statistics Agency. http://www.statistics.gr/portal/page/portal/ESYE/BUCKET/A1602/Other/A1602_SAM07_TB_DC_00_2001_07_F_GR.pdf. Retrieved 16 April 2011. ↑ "Demography Report 2010". Eurostat Yearbook 2010. Eurostat. http://epp.eurostat.ec.europa.eu/portal/page/portal/population/documents/Tab/report.pdf. Retrieved 16 April 2011. ↑ "Total Population". Eurostat. 1 January 2010. http://epp.eurostat.ec.europa.eu/tgm/table.do?tab=table&language=en&pcode=tps00001&tableSelection=1&footnotes=yes&labeling=labels&plugin=1. Retrieved 8 January 2010. ↑ "Πίνακας 1: Προσωρινά αποτελέσματα του Μόνιμου Πληθυσμού της Ελλάδος" (PDF). GR: National Statistical Service. 22 Jul 2011. http://www.tovima.gr/files/1/2011/07/22/apografh22.pdf. ↑ 7.0 7.1 7.2 7.3 "Greece". International Monetary Fund. http://www.imf.org/external/pubs/ft/weo/2011/01/weodata/weorept.aspx?sy=2008&ey=2011&scsm=1&ssd=1&sort=country&ds=.&br=1&c=174&s=NGDPD%2CNGDPDPC%2CPPPGDP%2CPPPPC%2CLP&grp=0&a=&pr.x=57&pr.y=16. Retrieved 26 April 2011. ↑ "World Fatbook - Greece: Government". CIA. www.cia.gov. 2007-03-15. https://www.cia.gov/library/publications/the-world-factbook/geos/gr.html#Govt. Retrieved 2007-04-07. ↑ Alexander Ypsilantis, Renamed from greek is based on ISO 843 standard. ↑ 10.0 10.1 [http://www.delino.gr/N38522010_KALLIKRATIS_FEKA87_07062010.pdf "NOMOΣ ΥΠ’ΑΡΙΘ. 3852 Νέα Αρχιτεκτονική της Αυτοδιοίκησης και της Αποκεντρωμένης Διοίκησης − Πρόγραμμα Καλλικράτης. (Law No. 3852 New Architecture of Self Government and Decentralized Administration - Kallikratis Reform.)"]. Government Gazette. http://www.delino.gr/N38522010_KALLIKRATIS_FEKA87_07062010.pdf. Retrieved 23 April 2011. ↑ 11.0 11.1 11.2 11.3 "Πίνακας 7: Αλλοδαποί κατά υπηκοότητα, φύλο και επίπεδο εκπαίδευσης - Σύνολο Ελλάδας και Νομοί". Greek National Statistics Agency. http://www.statistics.gr/portal/page/portal/ESYE/BUCKET/A1602/Other/A1602_SAM07_TB_DC_00_2001_07_F_GR.pdf. Retrieved 23 April 2011. ↑ "Greece – Report about Compliance with the Principles of the Framework Convention for the Protection of National Minorities (along guidelines for state reports according to Article 25.1 of the Convention)". Greek Helsinki Monitor (GHM) & Minority Rights Group – Greece (MRG-G). 1999-09-18. http://dev.eurac.edu:8085/mugs2/do/blob.html?type=html&serial=1044526702223. Retrieved 2009-01-12. This page was last changed on 3 December 2014, at 14:35.